FEATURES * 5 ranges : 40.00/400.0/4,000/40,000/400,000 Lux. * Resolution : 0.01 Lux to 100 Lux. 0.01 Ft-cd to 10 Ft-cd. * Selection of lighting type ( Tungsten, Fluorescent, Sodium or Mercury ). * Sensor used the exclusive photo diode & color correction filter, spectrum meet C.I.E. photopic. * Sensor cosine correction factor meet standard. * Separate Light Sensor allows user to measure the light at an optimum position. * Lux & Foot-candle unit selection. * Large LCD display with bar graph. * Water resistance front panel * Zero adjusting button. * Data hold and Peak hold. * Memory function with Recall. Auto * Auto power off or manual power off. * RS-232 computer data output. FEATURES * Sensor used the exclusive photo diode & color correction filter, spectrum meet C. I. E. Photopic. * Sensor cosine correction factor meet standard. * 0.1 Lux resolution for the low range * High accuracy in measuring. * Separate light sensor allows user to measure the light at an optimum position. * LSI circuit provides high reliability and durability. 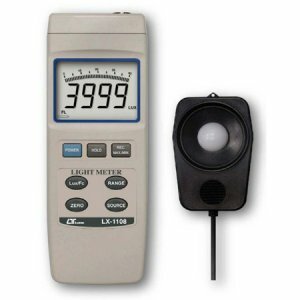 * LCD display allows clear read-out even at high ambient light level. * Pocket size, easy to carry out & operation. * Compact, light weight and excellent operation. * Built-in low battery indicator. FEATURES * Real time data logger ( record year, month, date, hour, minute, second ) * Sensor meet C.I.E. spectrum, 2 filters. * Max., Min., Data hold, zero adjust. * 200/2,000/20,000/100,000 Lux. * RS-232 computer interface * Unit : Lux, Feet-candle. * DC 1.5V ( UM3, AA ) x 4 PCs or DC 9V adapter in. * 4 light type selection. * Size : 203 x 76 x 38 mm.